Schaffners Plumbing and Heating is always looking for ways to make your home more efficient, and renewable energy is the wave of the future. If you are seeking the best, let us walk you through what a Geothermal Heating and Cooling system can do for you. Not only is it the most energy-efficient way to regulate temperature in your home; it's low maintenance. The loops buried in the ground can last for generations without requiring maintenance, as long as they are installed properly in the beginning. We have over 10 plus years under our belt that you can count on. The rest of the geothermal HVAC machinery sits indoors, so it faces little to no wear and tear from the seasons or an external environment. Regular maintenance tasks such as checking antifreeze levels and keeping your indoor components clean will cut the chance that any issues will arise. 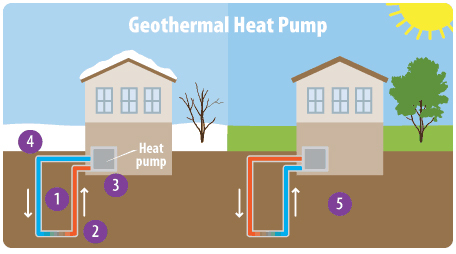 Geothermal technology harnesses the Earth’s heat. Just a few feet below the surface, the Earth maintains a near-constant temperature, in contrast to the summer and winter extremes of the ambient air above ground. Before we walk you through how a Geo works... Did we mention that there is up to a 30% Tax Credit, along with other utility credits you are already pre-qualified to receive? Call us for more information. Water or a refrigerant moves through a loop of pipes. When the weather is cold, the water or refrigerant heats up as it travels through the part of the loop that’s buried underground. Once it gets back above ground, the warmed water or refrigerant transfers heat into the building. The water or refrigerant cools down after its heat is transferred. It is pumped back underground where it heats up once more, starting the process again. On a hot day, the system can run in reverse. The water or refrigerant cools the building and then is pumped underground where extra heat is transferred to the ground around the pipes. Want to learn more. Please call us during normal business hours and we would be happy to walk you through it further, or request an estimate.